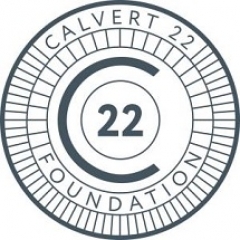 The Calvert 22 Foundation (a charity registered in England and Wales № 1134939) is a not-for-profit organisation dedicated to forging cultural links with Russia, Eastern Europe and the former Soviet republics. The foundation, which was established by Nonna Materkova, a Russian-born, London-based economist, was created in May 2009 with the launch of Calvert 22, a gallery dedicated to contemporary art from these regions. The gallery, which remains the cornerstone of the foundation’s activity, has received widespread critical and public acclaim. Located in Shoreditch, east London, it uses imaginative curatorial presentation to create a unique platform for the very best in current art from the “former East”. The foundation’s most recent initiative is The Calvert Journal, an online daily briefing on the culture and creativity of modern Russia, delivered through a mix of reportage, comment and photography. In addition to The Calvert Journal and the Calvert 22 gallery the foundation has developed a third initiative, also driven by the foundation’s ethos to spread knowledge and awareness across cultural borders - Calvert Education, an international university exchange programme. The foundation is supported by a long-term strategic partnership with VTB Capital, one of Russia's leading investment banks.